TOPAZ HORIZON: WIN! 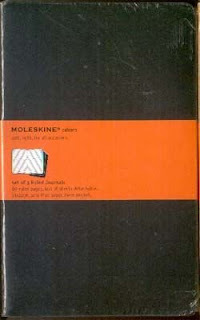 A Moleskine notebook! Now, to be honest with y'all, I may love blogging but nothing beats the smell and feel of paper and ink. And the best kind of paper to write down all your precious thoughts on are the Moleskine notebooks, legendary for being the notebooks that artists like Vincent Van Gogh and Pablo Picasso and writers like Ernest Hemingway used. You can't beat history like that! Vince and I are Moleskine addicts. Some of our friends know this and have given us Moleskine journals over the years. Thanks, my loves--these are truly the best gifts! Especially since Moleskines are so expensive! So now, I'm going to let my readers have a chance to own a Moleskine notebook! Avalon.ph--that wonderful online shop for Moleskine notebooks, rare books and other collectible literature--is the generous sponsor of my contest. Actually, it's their contest and they invited me to partner with them. The annual contest is called the Avalon.ph Bloghopping Moleskine Giveaways 2009. This year, my blog has been picked to be one of the participants. Thanks, Avalon.ph ! For this week, Avalon.ph and I will give a Topaz Horizon reader a Moleskine Large Cahier Ruled Black Set of 3. Avalon.ph makes the contest extra special by throwing in a PHP 500.00 online Gift Certificate! You can use this GC for the many rare or signed books on the site. I've found a lot of books I like--they're quite pricey and so I envy the reader who gets this GC! Answer this question in my comments box: "What is your favorite book and why?" You may join as many times as you wish (only 1 book per comment!). One comment/book means one raffle entry. Want even more chances of winning? Blog about this giveaway with a link to Topaz Horizon and Avalon.ph. Yes, you may grab the photos here. And yes, it can be just a P.S. or a little line. No need to be fancy! A blog post with links entitles you to a whopping 10 entries! UPDATE! Please leave your full name with your entry. I can't announce "The winner is Anonymous," for Pete's sake! I can't also say "Anna won it!" If you don't want to leave your full name, then make sure you have a link to your blog or email address. I've deleted the entries with unidentifiable authors--and there were a lot of them. Unlike my other blog giveaways, this particular contest is open only to Philippine residents, per Avalon.ph's request. On a side note, I'm so giddy I've been getting offers to sponsor my blog prizes. One day I hope to give away more expensive stuff, like iPods, mobile phones or even laptops (calling Apple and Sony--the brands I've given so much mileage in this blog!)! Anyway, contest closes on July 29, 2009, 11:59 PM. I will then pick a winner randomly. The lucky winner of a spankin' brand new Moleskine notebook and a PHP 500 gift certificate will be announced as soon as I had my breakfast on July 30. So good luck everybody! P.S. Don't trust your chances and you'd rather buy your own Moleskine notebook? Go to Avalon.ph and enter this coupon code upon checkout: topazhorizon. You'll get a 5% discount on any purchase of the Moleskine Large Cahier Ruled Black Set of 3! Yep, your being a Topaz Horizon reader has its privileges! My favorite book would be "Captain Corelli's Mandolin" by Louis de Bernieres. I used to never have a "favorite book of all time" before reading this book. The one thing that simply killed me was the story of the two warring sides set in WWII and the love that blossomed between an Italian soldier and a charming, intelligent Greek woman. The writing never ceases to amaze me the author beautifully maneuvers to shift around different perspectives: from a high-ranking, pompous official, a wise doctor, an embittered soldier, and finally to the two lovers. Hi there, I have a blog about your site and your contest. I like 12 Things Every Filipino Can Do to Help the Country by Alex Lacson. His book's like a little bible of useful, small yet practical things that people can adhere to to help the Philippines even in just a little way possible. Especially in this trying times. From simple obligations to the biggest ones, reading this and doing the tips can make every Filipino a hero--big or small. it must be The Lord of the Rings trilogy. They're books that I just couldn't put down. I love that it has all of the elements in one: adventure and the fantastic, war, a little romance, and most importantly, it is a story of friendship and courage. When I read it, I want to be one of them. I feel like I'm one of them. Hmmm... Favorite book this is a hard one since I got lots of fav books. Well this is my latest favorite book The Time Traveller's Wife by Audrey Niffenegger. I am not into love stories but this book caught my attention. I love that it has a happy/sad ending. I am not really into mushy stories. This is a book I like reading again and again. My current favorite book is Neil Gaiman's The Graveyard Book, a grim yet thoughtful coming-of-age story of a boy named Nobody Owens. The book draws you in and let's you experience the life of a young boy being raised by the residents of the Graveyard and how he faces up against the evils of the world outside of the Graveyard. It's a great read for fans of spooky adventure and makes the world of dark fantasy/horror accessible to younger readers. You fall in love with all of the characters from Nobody Owens to his witch friend Liza Hempstock and even the villains--the Jacks-of-all-Trades. Every chapter of the novel contains indelible scenes that you will always remember and the way Body bravely surpasses all of the dangers that threaten his life will inspire you to live your own life in the same fearless and adventurous manner. I've always been a fan of Neil's work because of his prose stylist manner of writing and his uncanny ability for creating unforgettably unique characters. The Graveyard Book doesn't disappoint. I plan to even get copies as gifts for friends as inspiration. It is more rewarding, insightful and life-changing than any other self-help book out there. It is one of the most powerful stories you'll ever read. my all time favorite book has to be: "pride & prejudice". years ago, when i first read it, i imagined that when i finally fall inlove that i would feel the same rush and excitement as elizabeth bennet did with mr. darcy. i relate much to elizabeth, because growing up i was never a jane. i wasn't dainty and coy... in fact i was often running with the boys... until later on of course, i realized i did like boys... and they liked me! The first that comes to mind is Lipstick Traces: A Secret History of the Twentieth Century by Greil Marcus. It's a tour-de-force exploration of punk and its place within a context of fringe counterculture ranging from Modernist aesthetic movements to Medieval heresies. my 2nd all-time favorite book is "The History of Love", by Nicole Krauss. it is a complicated tale about a man who has lived his life loving just one woman, all his life, but unfortunately, he loses her. i love this book because it is probably the most unpredictable love story i have ever read. a mystery in a love story --- alma singer, goes through lengths to discover the story behind the book her father adores so much: "the history of love". for that reason, this book, is remarkable! Physical Medicine and Rehabilitation By Randall Braddom. In a world of professional Medicine course, like me as a Physical Therapist. This Essential Book is a "must Have". Although lots of PT students hate this book and clouldn't stand reading it by just reading one page is enough they immediately fall asleep. But Me I like this book. The book discusses the diseases and give interventions on how to treat it in a physiotherapist way. The book is hard bound and it has 24 chapters approximately the weight is compared to 1.5 coke. The book not just serves as a source of my knowledge but the book also serve as my pillow during breaktime in class and also this serves a my self defense tool "kung may lokoloko" I could just smash him my Large heavy Braddom book. That's about my favorite book! I love Paolo Coelho's The Alchemist. The story is very inspiring. After reading the book, I know that all my dreams and aspirations in life are possible. On a romantic note, the line "the universe conspired for us to meet" is so 'kilig'. my favorite book would be TWILIGHT!!! !and the sequels.its soo relaxing to read seems like your in your own world with the characters. I have so many favorite books that sometimes, it really depends on what I'm currently reading to be called a favorite. And even then, I still can't pick one. But for a couple of years now, my favorite book would have to be Sorrow Floats by Tim Sandlin. I found in a department store's secondhand-books section, and I chose it at random because it cost PHP 99.00 (I was a college student, so yes, I was cheap, haha). I've never regretted my then-impulsive buy. Yes, the first quarter of the book is depressing (the first chapter of the book has Maury, an alcoholic, losing her baby because she left her baby on the roof of the car while driving--yes, the book is that insane), and its dark comedy borders more on dark than comedy, but throughout the book, it lifts my spirits as it shows the beauty of hope, perseverance, never giving up, and never judging a person by appearance. It shows friends who always come back to you even when you push them away. Of friends who wait for you even when you go away. And that one crazy friend who turns out to have known what was best for you all along. It is also a story about being dependent on a vice and realizing how you can be much stronger without depending on any substance. Reading the first few chapter might make me want to slit my wrists, but after reading it through, it gives me hope on living my life and living it for the better. i put the contest in my blog too... sorry super pending my comments. Yaaaay! another giveaway and this time I'll make sure that I'll posted the link in my comment! I don't have a favorite book! But I always wanted to read books of Bob Ong! He is very funny and some political criticism. I have a lot of favorites but my most recent favorite book is 'Lighthousekeeping' by Jeanette Winterson. I'll also try to blog about the contest soon! Hello! I'm Raph, 24 years old and an OFW in Abu Dhabi, United Arab Emirates. I've come to know your contest through http://thecontemporaryreader.blogspot.com. I can go on with a lot of my favorites (admittedly dominated by Murakami), however, THAT ONE BOOK that will be my desert island book will be "A Heartbreaking Work of Staggering Genius" by Dave Eggers. I brought the last paperback copy at National Bookstore, initially intrigued by its long title and a drawing of a stapler on the Foreword. I can say that this book changed the way I read, write, conceptualize ideas, and most importantly, deal with my life in general. It taught me how to be strong and resilient during hard times, and appreciate the "humour" behind it. Until today, it never fails to make me feel good about things even if life is hard especially as an OFW. Hope you guys would be able to read this book and get to absorb something positive similar to my case. one of my favorites would be 12 Little Things Every Filipino Can Do to Help the Country by Alex Lacson. It's one inspiring book that contains all the little but powerful stuff one can do to help the country improve for the better. Especially in this trying times. His book can show that one can be a hero may it be in big or small ways. mine would be Da Vinci code. yeah i know its overrated and that it is only a piece of fiction but once you read it, you just can't stop. i guess Dan Brown's writing style is superb. i've also blogged about this. I like a lot of books. And I cant pick one as a fave as the other books would get jealous. But there is this one book that I keep coming back. That I kept on reading when I am down, when I am blank. It’s ON THE VERGE by Karen Kunawics. The book is a compilation of a lot of stuff. Essays, Comics, Drawings, Letters, Tips. I like it cuz it talks to me. There this one essay with a line from a poem by rayvee sunico. Sound of one heart breaking – Parang papel na piunupunit. I can never forget that line. I can never forget that he was able to put a sound of one heart breaking. Mine was .. its just stop living. And theres no more sound. That is the sound of my heart breaking. And there are tips if you want to write. It said WRITE.WRITE.WRITE. Every time I’m reading it, it would give me a lot of emotions. That book is my time machine, bringing me back to when I felt emotions. I felt love, kisses, hate, breaking up and when I sometimes feel god is not there or when he is there. The Little Prince may very well be a children's book by Antoine de Saint-Exupery but its message spans across children of all ages and adults, too. The innocence of a child and its ability to comprehend the big world out there is enough to make you stop and think that things may not always be what it seem -- for "what is essential is invisible to the eye". * Sophie's World by Jostein Gaarder - I think, so far, this is one of the most information packed and philosophical books that get you thinking. It simply presents information in a manner that is interesting. * Veronika Decides to Die by Paulo Coelho - It presents an interesting take on the world, IMHO. * Tuesdays with Morrie by Mitch Albom - A life changing book that allows readers to rethink their lives and consider having a bigger purpose or meaning.. I have so many favorite books not just one but one of my favorites is Fight Club by Chuck Palahniuk because it's genius! My "first" favorite is Fortune's Hand by Belva Plain. I really loved its plot. It's all about how your life can change because of a single decision. My next entry is on a separate comment, of course. yay. John Irving's The Cider House Rules. I know they've made this into a movie but I didn't get to see it. So, I was surprised when I knew what the story is all about. I think the story evolves about life being a matter of choice. Choices in the matter of life, love, even a choice between an orphan or an abortion. Miracles of Pope John Paul Ii is another favorite of mine. It makes me believe that miracles are indeed real. For the book is a testimony that such thing happens. My favorite book would be jk rowling's harry potter series. Up to now, i really don't know why i love the book. Perhaps, it has something to do with magic, with finding lifelong friends, triumph of good over evil..not sure but i sure hop that this time i win the notebook! One of my favorite books is the life story of Madonna by Andrew Morton. Madonna ain't Madonna for all her quirks, her talent, she's a pure genius. It was fortunate of me to get ahold of such book that explained why she was always out there with all these news etc. She's the real marketing person. An artist and a marketing person in one. One of my favorite books is Pride and Prejudice by Jane Austen. I've read it so many times and watched several P&P movies and series. I enjoyed reading it because its the grandmother of romance novels. And because Darcy is simply adorable! my favorite book is "the missing piece" by shel silverstein. why? because it is the story of my life :-) i wrote about it once, in fact. i hope i win the last moleskin notebook!!!! My favorite book would be "Three Weeks With My Brother" by Nicholas and Micah Sparks. I have never been so engrossed with a book's drama. Having based on a true family story, the book totally didn't fail to melt my heart. I love the essence of appreciation and love for a family that it valued. Lastly, as a value-added, the book was a backstage pass to Nicholas Sparks' novels. i love jude deveraux's the duchess..
My favorite book would have to be Arundhati Roy's God of Small Things. My parents bought it for me as my 18th birthday gift - more out of necessity for my Literature class in college than sentiment but I am so glad that it was the gift they got me. Never have I felt so engrossed in a book as Roy's God of Small Things. Roy's work was absolutely delicious, delving into the sad injustice that happens to everyone, even to children. The story is an illustration of the constant push and pull of two opposing things/ beliefs trying to find balance - and the eventual inevitable of one finally falling and giving in. Another favorite book of mine is The Atrocity Exhibition by J. G. Ballard. Several decades down the line, it has yet to lose any of its rather frightening provocations. Experimental and perverse, ultimately moving and essential. My favorite book is The Alchemist by Paulo Coelho. It's a book I want my children, Nathan and Kelly, to read someday. I’ve been encouraging them to read, hoping that they’ll come across inspirational books like The Alchemist on their own. I told my son about the shepherd boy who had recurrent dreams and sold his flock so that he could travel to the Pyramids of Egypt and search for a hidden treasure. Like the shepherd, I want my children to believe in their dreams and work hard to achieve them. Maybe one day, they’ll be searching for their own Personal Legends. I want them to be courageous because Courage is the quality most essential to understanding the Language of the World. Above all, I want them to know that we, their parents, will always be there to support them in their endeavours. My favorite book would have to be: "The Best Little Girl In The World" by Steven Levenkron. It revolves around the story of a teenager who is suffering from anorexia. The story follows Francesca, a young high school girl who just wants to keep everyone happy – her family, her teachers and her ballet teacher. However, as she starts to realize that she cannot control all of them all the time, she starts finding other small ways to control the world around her, eventually leading to her decision to control the food she eats. And Francesca's nickname is well "Kessa". One of my favorite books is Jennifer Weiner's "Good in Bed." It is about an overweight woman's struggle with career and relationships, primarily because of her weight and self-image. It's one of the better chick lit books I've read. The writing is great and one can sympathize right away with the lead character. Weiner's writing is raw and real, which makes her characters more relatable. I'd recommend this book! My favorite book to date is Tuesdays with Morrie. Reading this book AGAIN helped me coped with my mom's death. It made me realize that life doesn't end in death that the life each of us lives is so full that it can't be taken away by our last breath. I use to think of life as passing but when my mom died, i just wanted everything to end, to be with her. But reading this book made me realize that i still have many things to do, to accomplish, dreams to fulfill, that I have people here who actually wants me to a part of their lives. It just humbled me so much. I'm currently trying to finish off Power of the Plus Factor by Norman Vincent Peale. I never though that book could actually teach me a lot about life and about being optimistic in general.I'll surely keep that in my library. Another title! Simon Reynolds's Rip It Up and Start Again: Postpunk 1978-1984 is a work of music history and criticism so engaging that it manages to be simultaneously encyclopedic and personal. I also have a lot of favorites but currently my faves are the Twilight book series. I'm afraid of vampires but these vampire books got me swooning. I thought I'd be bored with it but it got me hooked with the unexpected twists and turns. It's no wonder they are bestsellers. Another fave is Schindler's List. Gosh, that book was heartbreaking and at the same time, soulsearching for me. It was bleak and hopeful, at the same time. Well-researched, well-written and a most for everybody to remind us that war is never an answer to any king or president or world leader wannabe. The consequences and the atrocities are just incomprehensible. The bright thing is that inspite of all the evils shown, human goodness still prevails. how cute is it to know the story of guys taking on a role of fathers with them being so completely clueless at all?! On the comical side, Bob Ong's Bakit Baligtad Magbasa ng Libro ang mga Pilipino and ABNKKBS NPLa Ko does the trick for me. the first one for showing the Pinoy's real side from our tradition and the culture that we have and the second, for blessing me with the time to travel to the past during school days and laugh on some of the crimes and deeds that I'm also guilty of doing during my school days. With regards to novels, I also like reading Nicholas Sparks' A Walk To Remember.This makes me cry most of the time--regardless of how many times I've been reading it. The story makes me believe of the author's conviction. That if your look for true love, you will certainly find it. Sounds mushy but probably true. The book I love to read right now is Pinoy Poetics, which has essays by Filipino & Filipino-American poets. It's a diverse gathering of voices (nostalgic, irreverent, cause-committed, sometimes all three) that challenges my beliefs about poetry and life in our part of the world. Hi Ms Frances! Pat here. One of my favorite books is "Wander Girl" by Tweet Sering. I like it because compared to other chick lits, it has a brain and the main female character does not get married in the end. The storyline is real and realistic, something people (not just women!) can actually relate to. I'm a true romantic by heart, that's why my favorite book of all time is "The Notebook" by Nicholas Sparks. I have a special bond with the book everytime i read it. It's more than just turning the pages, what strikes me the most is by how the words affect me, how Sparks' writing encapsulates me and makes me feel as if i'm living the character's (Ali) life. My most favorite line goes like this (not verbatim): the reason why it's hard to separate is maybe because our souls are connected. Gosh. i can totally relate to this, because i happen to have experienced a semi-the-notebook-kind-of-lovestory. sadly, it didn't end like the notebook's ending. i recommend this to all my friends :) and especially i dedicate this book to him. he knows who he is. This book seems to find people when they need it. It found me when I was in a low point and trying to search for myself.. This book is based on the real life experiences of the writer and her one year quest to do what she always wanted to do. With this book, I found my old outer strength again by having a strong inner strength first. I also love "The Lord of the Rings" book. It is considered as the greatest trilogy. When I read that I felt as if I was in the Middle earth too. I believe it's one of the greatest book of all time. I lvoe self-help books and Being Happy of Andre Matthews is one great book. It has powerful illustrations and applicable to real life scenarios. My absolute favorite is the Masters of Rome series by Colleen McCullough. I've always been fascinated with Roman history, but I find most history books really boring. Being a historian, Colleen McCullough writes about facts. But being a novelist, she puts in a bit of drama, too, and as a result, I got to get to know great people like Julius Caesar and Augustus Caesar better. Out of my overflowing stack of books, I must say that For One More Day by Mitch Albom is my favorite book. Not that I have a near death experience like the main character's experience, but because I learned to cherish the people in my life every waking day. This book also made remember the values that were taught by my grandmother while growing up. I'm also into Chicken Soup for the Soul series. I have Chicken Soup for the Writer's Soul being a writer myself, i think it's a must second to the Elements of Style. As well as Chicken Soup for the Couple's Soul which despite of my bitter experience about a relationship gives me that kilig feeling as well as tears and joy with each awesome and inspiring love story. A book that makes me live by what Boy Abunda once said: always have the courage to love one more time. Always one more time. My favorite book would Haruki Murakami's Kafka on the Shore as I can relate to the protagonist's love of reading. Another favorite book of mine is Dragons of Autumn Twilight by Margaret Weis and Tracy Hickman. It tells the adventure of a group of friends whom faith has choosen to save their world. I actually liked the notion of the "balance between good and evil" here. This book started my collection of the Dragonlance Saga which by my count today has amounted to about 100+ books. For my third entry.. Another book in my "Favorite" list is Miyamoto Musashi's Book of Five Rings. I know a lot of people would not read this Samurai's Journal. But for me this is very interesting as there are a lot of interpretations of Musashi's thoughts and with my inkling for Philosophy, this is definitely a must read! I have a lot of favorite books. But the one book that beats out all the rest of the great literature I've happily come across with would be Gabriel Garcia Marquez's One Hundred Years of Solitude. I read it when i was 15 (I'm kinda an old soul :))and magical realism instantly reeled me in. For me, there was always something enigmatic and romantic about the way Marquez writes. All the while I was reading it, I felt as if I had the grandfather I never had growing up telling me stories about my family and inevitably, myself. I love the Harry Potter series! I love reading about the boy who lived's exploits. I also love his friends and teachers. I'm always transported to the wizarding world whenever I read and reread each book. The last book was especially brilliant! I'll surely encourage my children to read the Harry Potter series someday. My all-time favorite book is Harry Potter and the Half-Blood Prince. I've read all my Harry Potter books at least 4 times each (hehe) but this one is really my favorite. Maybe because in this book, Harry and Ginny's love story really began. =) I know it's sad that Dumbledore died in this volume, but I really love it.